What’s the Halflife of a Turnaround? There’s been considerable discussion among the Enterprise Irregulars sparked by Vinnie Marchandani’s post about Jerry Yang. Vinnie is quite passionate about the idea that a venerable web entrepreneur like Yang should be given a lot more of a chance, and that a non-techie like Carl Icahn should be reviled. The Irregulars reacted pretty negatively to the post. The general sense was that it was time for Yang to move on. Larry Dignan picked up on this theme as well. Like me, he is generally tired of the whole spectacle. Vinnie stuck to his guns though, and posted again, speculating about what might have happened if Steve Jobs was in this position after getting back to the helm at Apple, or Mark Hurd at HP, or Gerstner at IBM. All of those have been successful turnarounds. Perhaps there just hasn’t been enough time for Yang to make a difference. While I am a bit fatigued as I mention with the whole topic of Microhoo, I was nevertheless curious about this comparison Vinnie draws with Apple, HP, and IBM. What if we could rearrange time and compare these three companies side by side, exactly aligning the timing of the new boss taking the helm. Could we tell which ones were undergoing a successful turnaround, or would we have to wait much longer to see a result? During Mr Yang’s tenure, Yahoo’s stock is essentially flat. There was no real discernible trend until Microsoft got involved and as we know, that trend went away. As a matter of fact, the stock spends most of its time below the green line connecting the opening and closing of the period. Clearly the market immediately had little confidence. Contrast that with the performance of HP’s Mark Hurd, where the stock closes out the period up 29%, or Apple where the market loved Steve Jobs immediately and closed up a whopping 67% by the end of the period. Is this the wisdom of crowds or just good PR? It’s hard to tell from this data, especially since we know a lot more about what happened at HP and Apple after the period depicted–things continued to go much better. We don’t know for sure what would happen if Jerry Yang thwarts Carl Icahn and manages to stay in place. The market is not a patient place. 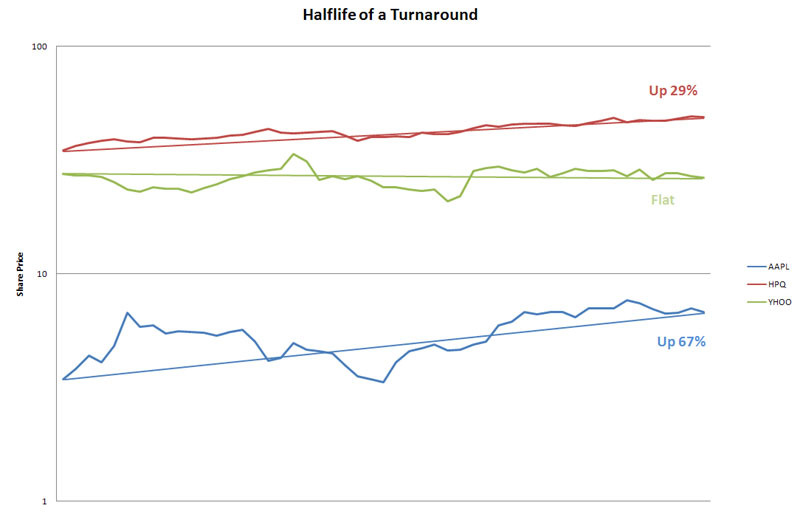 The halflife of a turnaround looks to me like it’s about a year or less. If a new CEO can’t inspire confidence in that time, the market is unlikely to leave him in place. Hard to say whether it’s fair or not, but it’s also hard to argue that Apple and HP didn’t do a lot better over the same period.